Questioning what it meant to experience as a traveler versus resident, I personally experienced both onsite drawing of what I observed as a temporary resident and quickness of photography at the other sites as a tourist. 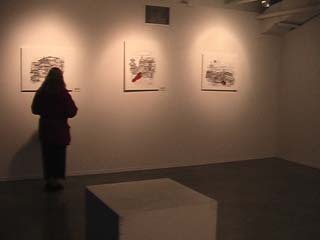 Installation: drawings; 5:25 minute video. 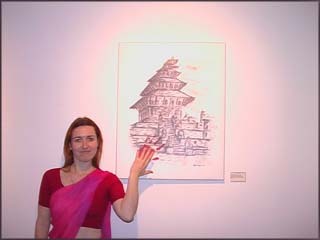 Bkahtapur, Nepal; Calgary, Canada, 2004. The "finish-touched" in this title is visual thinking in American Sign Language, which means, "I have been there." This work implies how a tourist travels to "landmark" (pun intended) or "touch" the sites and pose for a picture. 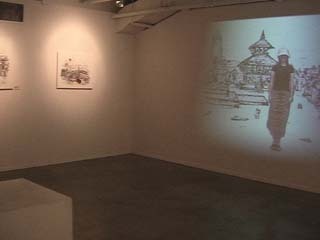 The video demonstrates a contrast between an experience of observing-drawing in a slow-paced living museum as a resident and an instant moment with superficial sensations in a photographing-looking akin to a similar effect of the fast-paced information age. It looks at the concept of absence/presence in relation to speed and space, between slow-paced observation through drawing process and personally removed quick documentation for a memory process. 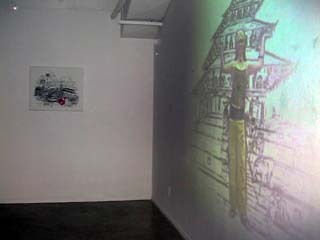 It contrasts between the aura of Bhaktapur, known as the living museum, and an alienation of objects in a museum. This work reconsiders a relationship between: sacred and secular social rituals; activity and passivity; spectacle and performance; living art/environment and virtuality. 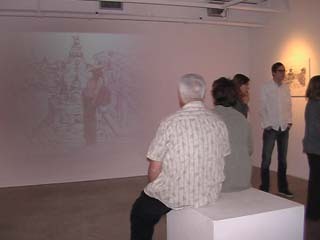 The "Finish-Touched: Living Museum - Virtual Living" exhibition ran from November 29th to December 4th, 2004, in the Marion Nicoll Gallery at Alberta College of Arts & Design, Calgary. 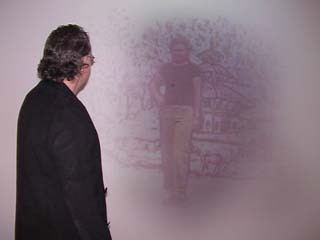 Life-sized, loop-based video projection on the rear side. 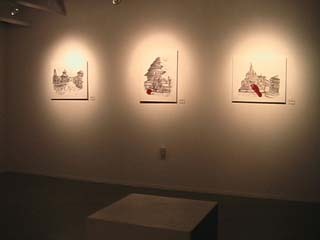 Right and left sides: series of drawings with red life-sized footprints and handprints of the artist. Close up: Living art (the artist) and her work. 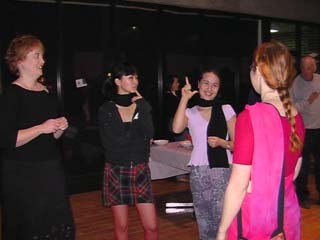 The opening reception took place at the Marion Nicoll Gallery at Alberta College of Arts & Design, Calgary, on December 2th, 2004.